My favorite term of endearment in French has always been mon petit chou chou, which literally translated means “my little cabbage cabbage”. The French use it to mean something like “my sweetheart,” and it may or may not actually refer to a pastry instead of cabbage. Regardless, the literal translation made me giggle when I learned it in high school and it still makes me giggle today. Please, call someone you love a “cabbage cabbage” today and wait for their reaction. If you want to say it in French, chou sounds just like “shoe”. I dare you. Anyway, my favorite French term of endearment has come to mind often this winter as I’ve sliced up Brussels sprouts to roast for dinner. Having never eaten Brussels sprouts as a kid, I was intimidated by those foreign baby cabbages. This winter I vowed to get over my apprehension. I learned to like them on my first attempt: steamed on the stove and oven roasted under a layer of Fontina cheese. Like turned to love when I learned to roast them, halved, in a cast iron pan, and I officially tombé amoureux (fell in love) when I found a quick sauté and broil method that bakes my little “cabbage cabbages” in under ten minutes. Since falling in love with Brussels sprouts, I have singlehandedly put away at least 10 pounds of roasted sprouts. I love their salty, crispy exterior and softer, steamed interior. Technically speaking, Brussels sprouts are not baby cabbages, but a special kind of miniature cabbage. The flavor is a bit reminiscent of broccoli, which makes sense because they are both Brassicas. Brassicas are notoriously high in anti-cancerous, DNA protective properties. I crave Brussels every few days, and I’ve developed an odd habit of eating a huge bowlful of roasted Brussels after my weekly yoga class. Desolée, mes petits chou choux, I think as I slice off their tails and cut them in half. By the time I bite into crisp, roasted sprouts, I’m not really sorry at all. In addition to my newfound love for Brussels sprouts, I’ve been becoming more adventurous and knowledgable about various types of whole grains. Every time I visit the new health food store in town, I make a point to buy a new variety. So far I’ve tried wheat berries, farro, Kamut, steel cut oats, and most recently, barley. I like to cook up a big batch of whole grains and try to come up with ways to use the leftovers over the week. I think it’s a good way to become acquainted with a grain, and it’s a very cheap way to eat. Though I haven’t made any direct taste comparisons, I think that wheat berries, farro and Kamut are all pretty similar in taste and texture, and could easily be substituted for one another. I expected barley to be like the others, with a chewy exterior and soft interior, but I was surprised to find that it is fluffy and soft. Barley seems like a cross between brown rice and oatmeal. Thus it’s a little creamy and almost risotto-like, which makes it the perfect grain to soak up dressing in this recipe. Another thing I’ve learned about cooking whole grains is that their cooking time varies, sometimes even from the time listed on the bag. I just mixed two cups of uncooked, hulled barley with six cups of water (a 1:3 ratio), let it come to a boil, and then simmered it, covered, for a little less than an hour. One cup of uncooked barley will yield plenty for this recipe and two cups of uncooked barley will leave you with tons of leftovers. I encourage you to get creative and come up with new ways to enjoy barley in your cooking. This recipe is one that I’ve been working on for a while now. 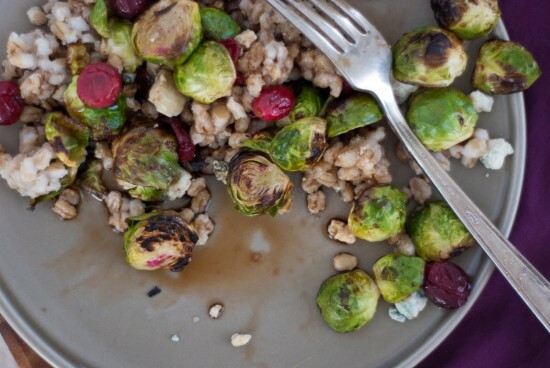 Brussels sprouts tossed in a light maple syrup and balsamic dressing pair marvelously with sweet, freshly cooked cranberries, and a bed of creamy leftover barley is the perfect final resting place for mes petits chou choux. 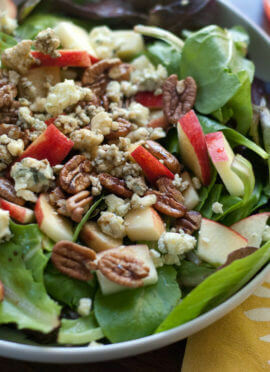 Tangy Gorgonzola cheese melts into the barley and toasted pecans add a nice crunch. This dish is easily deconstructed, however. Feel free to roast the Brussels sprouts with this method, and toss them with salt and a squeeze of lemon juice for a snack. Brussels, cranberries and pecans without barley make a great side dish. If you can’t find fresh cranberries, you can substitute dried cranberries (which is a shame, in my opinion, but do as you wish). 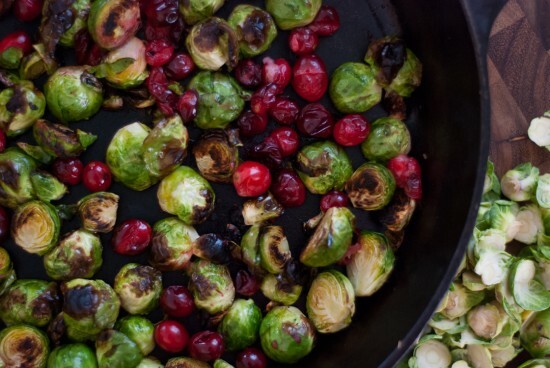 Just toss the dried cranberries in with the sprouts after they’re done roasting. Vegan? Omit the cheese. 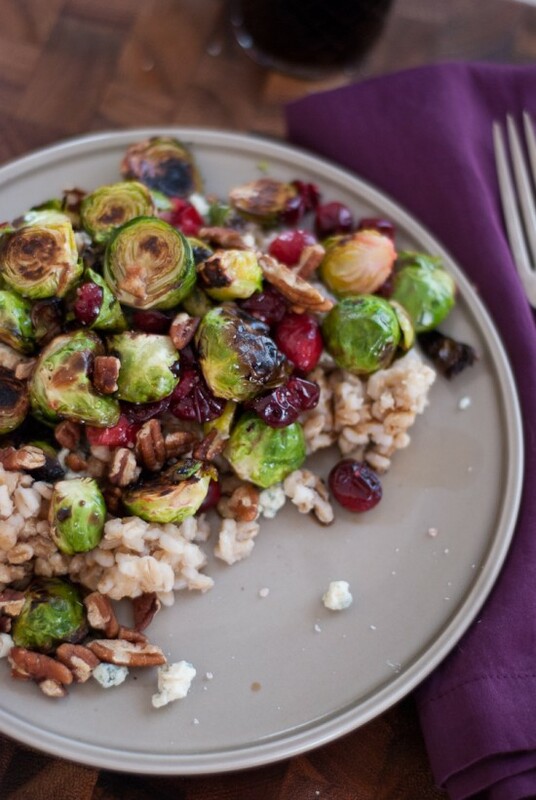 Crisp roasted Brussels sprouts meet sweet cranberries, pecans, and Gorgonzola cheese on a bed of barley. This delicious winter meal is ready in twenty minutes! In a medium sized bowl, toss the prepared Brussels sprouts with olive oil and salt. Toss well, so that the sprouts are evenly coated in a thin layer of oil. Once the pan is hot, dump the sprouts into the pan and quickly rearrange them so the flat sides are face down. Let them cook for two minutes. Toss the fresh cranberries into the pan and transfer the pan to your broiler. The pan will be heavy and hot so use oven mitts and be careful! Let the Brussels broil for about three minutes. Check the sprouts for doneness—their tops should be a little browned and the bottoms caramelized. How long you should leave them in there depends on your preferences and your oven. The cranberries should have started popping by now; set the hot pan on your stovetop for a couple of minutes while you reheat the barley. Toss the warm barley, sprouts, cranberries, cheese and pecans in a bowl and drizzle with balsamic vinegar and maple syrup. Season with salt, divide into smaller bowls, and enjoy! Recipe adapted from Love and Lemons’ maple and balsamic roasted Brussels sprouts recipe and one of Mark Bittman’s recipes in The Food Matters Cookbook. The quick-roasted sprouts method is adapted from The Kitchn. Make it vegan: Omit the cheese. Make it nut free: Omit the pecans, or if you feel like experimenting, try adding pumpkin seeds instead! Recommended equipment: I highly recommend using a 12-inch cast iron skillet rather than a large oven-safe, non-stick skillet because typical non-stick skillets release toxins at high temperatures. 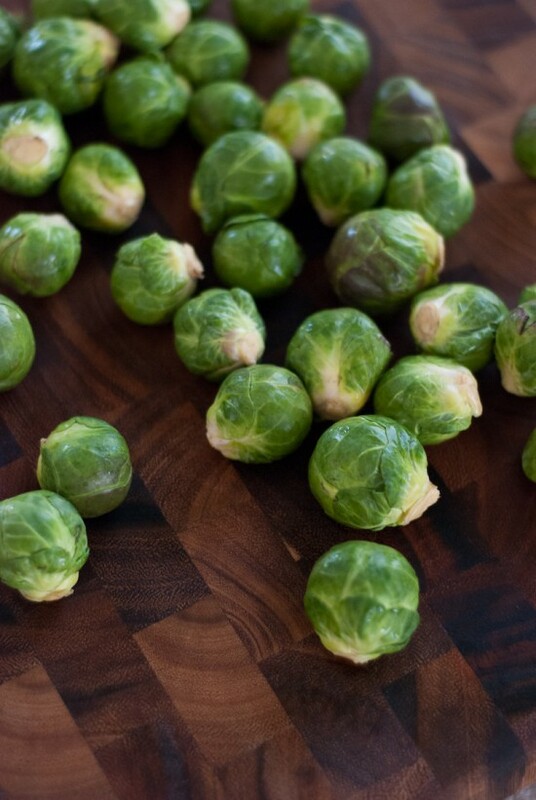 Preparation tips: Brussels sprouts are best cooked flat side down because the heat gets trapped inside the sprout and, in effect, steams it. It’s the best way to get crispy flat sides and cooked insides. A note on the pecans: If you’re adding pecans, I recommend toasting the pecans over medium heat in a separate pan. They will burn over high heat. Last but certainly not least, I have an exciting announcement to make! Sarah of 20something cupcakes and I are starting a community cooking project called The Food Matters Project. Sarah brought The Food Matters Cookbook to my attention a few months ago because she loved the recipes, but mostly because it had given her a new viewpoint on food. I bought the cookbook, and after reading through the introduction, realized that Mark and I share the same cooking philosophy—that eating more plants and whole grains and less meat and processed food is better for our health and the environment. Then I poured through all 500 recipes, dog-earing many of them to try later. I adore the recipes because they’re healthy, simple and versatile, which are all essential recipe qualities in my mind. Truly, if I had to pick one cookbook to recommend above all others, it would be this one. Sarah and I are so enamored with Mark Bittman’s recipes in The Food Matters Cookbook that we want to build a community around it and cook through the book together. If you want to learn how to cook healthy food, try new ingredients, or challenge yourself creatively, this project is for you. We can’t wait to see how you interpret his recipes! Just like Mark Bittman, we want this project to be as unfussy and approachable as possible. Bloggers and non-bloggers alike are welcome to join, and you decide whether or not you want to cook the selected recipe each week. And just so we’re clear, we have no affiliation with Mark Bittman; we just feel that his cookbook is perfectly suited for a group cooking project. Learn more about the project at our new website, thefoodmattersproject.com, and follow our facebook page for updates! You can buy the book over here. I hope you are as excited as I am about the project and I hope you’ll participate. We launch on February 6, so get ready! I’m doing this next time, ferrr sherrrr. Woah, this has absolutely everything delicious in it! What good flavor combos. Very good, my little cabbage, cabbage! I haven’t tried Brussels sprouts with gorgonzola before- looking forward to it! I’m off to check out your new site! Merci beaucoup, Jess! We’d love for you to participate or help spread the word. Perhaps our recipe selection could coincide with your weekly theme sometime! looks fantastic! love roasted brussel sprouts!! so good! Mmm I love a good dose of roasted brussels sprouts! Yum! 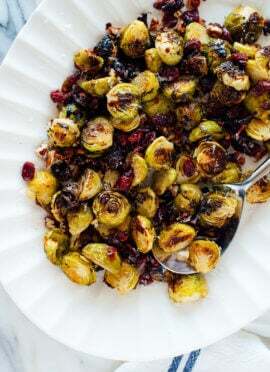 I love the flavor combination of brussels and cranberries. Off to check out that site, I’m intrigued! Gorgeous composition on that first shot, Kate. Love it. Saw a recipe similar to this using roasted grapes in Whole Living last month, this is just a lovely. Thanks, Kelsey! I’m heading to the store to buy grapes right now. I haven’t seen the Whole Living recipe, but I’ve seen roasted grapes popping up all over the place lately (like that baked sweet potato you pinned). It is time to give roasted grapes a try! I have a newly born love for brussels sprouts, too. I made them with pomegranate and pecans as a side dish for Thanksgiving (http://mylifelovefood.blogspot.com/2011/11/thanksgiving-for-two-due-e-un.html) and I loved it, and yesterday i tried to roast them with some chestnuts, also very good. Now that you make me think of it, I actually never mixed them with grains –and I am one that love grains like farro and barley– but now that you make me think of it, I will surely try! Great one-dish complete meal, colorful and balanced. Bravo (pronounced with a French accent :D)! I love everything about this recipe! Roasted Brussels have become one of my very favorite winter side dishes, and the trio of cranberries, pecans, and blue cheese is fantastic. I have also been experimenting with different varieties of whole grains, and barley is on my list! I am definitely going to be making this =). 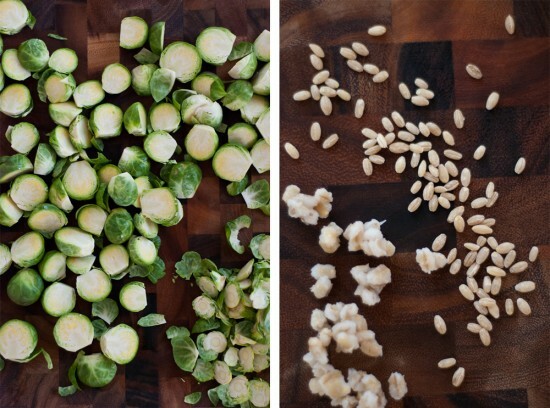 I love barley and brussels sprouts… this recipe looks awesome! oh, and I’m excited about the new project… I def want to participate! Yay, so glad you’re on board with The Food Matters Project, Niki! I can’t wait to see what you come up with. Aren’t brussels just the best that way! Your recipe is making me salivate! I’m trying to branch out and experiment with more with grains lately too and always make a big batch so I can figure out what to do with them later in the week. I’m so glad you shared the secret to roasting brussels quickly! Your tips totally fueled my brussels obsession. Thanks, Jacqui! Beautiful pictures! They just might convince me to try brussels sprouts again, which have NOT been my favorite, to say the least. But cooked this way and with these flavors? Seems like that could make all the difference. As for the Food Matters project, I’ve actually been looking for something like that! And I can’t think of a better vehicle for keeping a heathy new year’s focus than using that book. I’m in! I think you would like these crispy brussels sprouts, Marcia! I don’t like them steamed or cooked whole, but these are truly addictive. So glad to have you on board with The Food Matters Project, too! Your photo makes it all look so delicious! I love roasted Brussels sprouts and I imagine pairing them with those other ingredients would be wonderful. Also loving that you’re still cooking sprouts – so many people just eat them at christmas but I think they’re so delicious and love finding new recipes like this one. Y’know, there are times that I decide what grain I’m going to serve for dinner based on how long it will take to cook! Which means that there’s not as much brown basmati rice served around here as one might think. Ha! Love the Food Matters Project! I’m a huge Bittman fan myself, so I will definitely be following! Thanks for following the project, Lesley! So glad you’re interested. Bittman’s recipes really are the best! Ooh, what a fun project, I’d love to participate! I’m glad you liked my recipe – I’ll have to try the skillet-in-the-oven method next time! Thanks for inspiring the maple syrup and balsamic vinegar dressing, Jeanine! We’d love for you to participate in the project! This is perfect for the carton of cranberries I have waiting in the freezer! Love the combination of salty and sweet — and I am a big fan of those little cabbage cabbages! Exciting to hear about this new Mark Bittman project, it sounds wonderful! just bookmarked this…so many of my favorites in one dish! Love these brussels sprouts. Extra fun with the maple, gorgonzola & cranberries! Pinning now! Brussel sprouts are the single vegetable that I usually don’t care for. However, this recipe may change my mind. Usually they are a tad bit too bitter for my taste, but heck…maple syrup and cranberries! Sign me up. This looks delicious. Also, uber excited about your new Mark Bittman project. Love him. Thanks! Your beautiful blog always leaves me hungry to treat my body good with some healthy (and freaking delicious) food! This looks wonderful! I love barley, haven’t had it in…ages. Like..years. What is wrong with me, huh! And B.Sprouts are a fave of course. oh my goodness. This, I will be making. It looks amazing. Thank you for the recipe! Looks fabulous and colorful! What a great way to eat your brussels sprouts. Hi Kate! Just came across your blog and so happy I found it. It’s lovely. Beautiful photography and so many recipes I can’t wait to try. This one looks great. I love brussels sprouts. I am your newest follower! This looks good. I’m addicted to cranberries these days and this seems like the perfect thing to stave off the slight bitterness that brussel sprouts have. I made this on Monday night and my husband couldn’t stop talking about how good it was. This will be a regular recipe for us now! How marvelous and stunning is your blog?!!? Just found it via Twitter and Parker Etc. Bookmarked!! I want these asap!!! my mouth is watering in anticipation. Thank you for the delightful ideas in food! This recipe has inspired me to buy one of the giant stalks of brussels sprouts at the farmers market this year and experiment. The ones trucked in out of season at the store just aren’t as good as the ones the visiting chef cooked up at the market last year. Plus, the stalks look like some kind of alien hatchery and it’s fun to introduce my little one to new things. This dish has it all – good looks, healthy eating, easy to execute and delicious. I made this for dinner tonight and loved it! It was the first time I have tried barley before, too. I love trying new grains! And I really liked how you added cranberries to this recipe, the extra pop of flavor AND color was perfect! :) I think I just might have to make a version of this with different flavors tomorrow night. I’m thinking garlic and onion? Yum. The possibilities are endless. Glad to hear you enjoyed the barley, Andrea! I think it’s fun to try different whole grains. If you liked this Brussels sprout recipe, I suspect you’d also love my baked pasta recipe with Brussels sprouts and apples… sounds weird, I know, but it’s so great! Kate, you are my fresh veggie culinary hero! I just made this…so easy and so good! I’ve never been a huge fan of Brussel Sprouts but this is absolutely delicious! I used goat cheese, walnuts and dried cranberries. Will make this again for sure. I’m so glad you enjoyed the recipe, Martha! This is by far my favorite way to cook Brussels sprouts that I have found so far. Thank you for commenting! I just made this. It’s spectacular! Taste, colors, everything. I subbed red wine vinegar in for balsamic and honey for maple syrup, because that’s what I had on hand, and it turned out great. Thank you! Hooray! I’m glad to hear you enjoyed the recipe, Elizabeth. It’s one of my favorites! Thank you for sharing this! I just made this dish minus the barley and cheese and it was AMAZING! Brussels sprouts never tasted so good. My new favorite recipe for sure. Thanks, Sara-Marie! Happy to hear it. Thanks for sharing! Made it tonight for company and wowed them! It was delicious and unique. I’ve never cooked ith barley before, but now I think I’ll use it more. I did make the mistake of think 1 1/2 cup uncooked barley = 1 1/2 cup cooked barley. Now I have a lot of barley to use this week. So glad you enjoyed the recipe, Christine! Thanks for the comment. This recipe rocked my world! Used walnuts instead of pecans and dried cherries instead, but it had incredible flavor and filling for a Meal by itself! Glad to hear you and your sister enjoyed the recipe, Stefany! 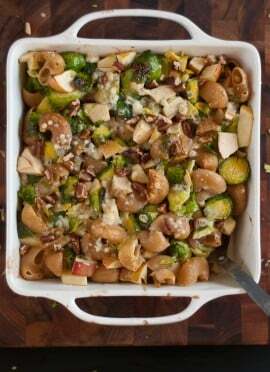 hello Kate, I was immediately in love with this great recipe, so much so that I scrolled further and saw your other great Brussels sprouts pasta bake recipe and decided to make them both as autumn salads on my blog. If you see an increase of Belgian visitors in the coming days… I am to blame! thank you for all your recipes they are inspiring and yummie! That’s great, Catharine! This cooking method is definitely my favorite way to prepare brussels. Glad your family enjoyed them! would this taste good if it was served at room temp? not immediately after cooking? Yes, I think it would, Steph. Or if you could warm it in the oven beforehand, that might be even better. Either way, I would suggest adding the cheese just before serving. I really want to try to make this dish for Thanksgiving. I’m wondering how well the brussels sprouts hold up as oven space is going to be hard to come by. Will they still be good if I make the a few hours ahead of time and then warm them up? Or should I maybe just make them another time? I’d love to hear back from you! Thanks for your time and the awesome recipe! Great question, Jenny. I think the dish will still be great if you do as you mentioned. I remember enjoying the leftovers quite a bit the next day. You might want to wait to add the cheese until after you reheat the dish, just because the dish looks prettier if the cheese isn’t totally melted and mixed in. I’m sorry I didn’t answer your question in time, Rebecca. Hope your Thanksgiving meal turned out wonderfully. I love what you had to say about the Food Matters cookbook! I had not heard of that book but am immediately adding to my christmas list! I started a food blog myself last May, primarily for the reason that as a vegetarian I want to support and witness to this diet because it is So much better for the environment. So far I have had a lot of support and love seeing other people out there like you with similar energy for healither lifestyles and a healthier earth. I am trying this delicious recipe tonight and cannot wait to taste it! It looks absolutely delicious. Thanks for all your work! Thank you, Sarah! I think you will enjoy his cookbook. It’s always great to hear from another like-minded eater. Best wishes to you and your blog. I love your blog. I recently found it after starting my own blog and wanting to check out the competition. Yours is absolutely amazing. I really can’t compete. I saw your recipe for Brussels sprouts and immediately was drawn to it. I like them a lot myself. The funny thing is that where I live (the netherlands), they’re really old fashion. My mother never made them when I was young, because of the smell and the bitter taste. But now I really like them. I used to have this fase, trying to make them less bitter by adding fruit, cinnemon and stuff. Went horribly wrong, not nice at all. After that I kept to more traditional recipes. But now… And I’ve got some maple syrup in my kitchen. Thank you for your kind words, Cisca. I was always afraid to try Brussels sprouts but I absolutely love them when they are cooked this way. Hope you get a chance to try the skillet method soon! This dish is awesome! I love the fresh cranberries in this dish and the slight sweetness the maple syrup adds. It also looks festive with the red and green! Do you have the nutrition facts? Thanks again! Thanks, Alyssa! I’m glad you like it. I’m sorry, I don’t have the nutrition facts but if you calculate them, please let us know. This recipe was awesome! So delish. I am adding this to my regular winter rotation. Thanks, Denise! I’m so glad to hear that. I found your recipe on Pinterest, and I love it. I’m big on substituting whatever I have on hand in recipes and have used sliced almonds or chopped hazelnuts as the crunch, sliced peaches or persimmon as the fruit and quinoa or brown rice in place of the barley (if I even use a grain). The strangest substitution was when I dumped a couple of handfuls of trail mix into it. It worked suprisingly well! Anyway, thank you for sharing this wonderful little recipe with us. Funny! I added roasted almonds because I picked up the wrong can at the store, but it was just as good! I calculated how many calories per serving and it came out to around 440 cals. Not bad at all! Not bad indeed! Thanks for sharing your nutritional calculation with us. I just made this as a side with steak. One of the best sides I have ever tasted in my life. It was absolutely delicious. The only thing I changed was: instead of honey/balsamic vinegar, I mixed apple cider vinegar with coconut palm sugar. Thanks for posting this! 5+ stars! I also didn’t use any barley or rice (paleofied it!) and I used slivered almonds because that’s what I had on hand. Thanks again! Angela, thank you for your glowing review! I’m so glad you enjoyed the recipe, it’s one of my favorites. Just made this. Omg. So. Good. Thank you! I am OBSESSED with this recipe. I have to replace the barley with quinoa due to my allergies, but I am seriously in love with this dish! It is a meal – sometimes a few nights a week. Thank you for sharing it!! Woohoo! Really glad to hear that you love the recipe so much, Elizabeth. Thanks for commenting! Glad to hear it, Marilena! Broiling the brussels sprouts with the cranberries was such a great idea. We just made a vegan variation and it is so good. We put the nuts (we did walnuts) in the broiler with brussels sprouts and cranberries and they burned, so next time we will add them in at the end as you said. But back to how good this was, my fiancé was just stealing some off my plate as I wrote this comment. Thanks, Kerry! I’m so glad you both enjoyed the dish. Thanks for sharing your feedback! I love this recipe! I have made it 4 times in the last six weeks. It is so delicious and so filling. Love the sour taste of the cranberries with the sprouts and maple syrup. Mmmmm. I would never have thought of putting these ingredients together. I have come to like barley through making this recipe. Thanks for a delicious recipe! Thanks, Cindy! I almost forgot about this one, but it’s one of my favorites! I LOVE this recipe. It is a holiday favorite of mine. Thank you for creating and sharing! It’s fall and time to start eating this fabulous recipe again! It’s my favorite and have told many people about it. I always eat too much of it because it’s so good! Thanks for such a delicious and healthy recipe! Amazing taste, used some garlic and lemon for roasting the Brussel sprouts to make it to bit more fresh since I only had dried cranberries. Garlic and lemon sound great with this, Josie. Frozen cherries sound amazing with this, Heidi! I think that’s a great substitution. This has been a household favorite since I read the recipe years ago. It goes over so well at pot lucks despite the initial weary looks & concerns for looking too healthy to taste good. My favorite mods are adding thick, crispy bacon, then subbing walnuts, & red & white quinoa. This is a home-run! We made it two weeks in a row. Love that! Thank you, Rachael for your review.